Jason O Mahony » Blog Archive » Is Nigel Farage the unwitting tool of Ernst Stavro Blofeld? Is Nigel Farage the unwitting tool of Ernst Stavro Blofeld? Supposing you wanted to secretly take over Britain? How would you go about it? Well, one step you’d almost certainly take would be to disarm Britain’s ability to prevent you carrying out your diabolical plot. That could involve eliminating Britain’s most famous secret agent, of course, but it could also involve depriving the UK of its direct ability to control or influence events. In short, tricking the British into withdrawing from the European Union would be a masterstroke. Think about it: of course Britain will still trade with the EU after withdrawal. But the reality is that many British companies, with an eye to the continental market, will lobby their home government to effectively copy EU regulations because it’ll allow them to save money by having the same manufacturing and compliance regime for both the EU and UK markets. Regulations which, after withdrawal, Britain will have no say in creating or amending. It’s true, Britain will not be LEGALLY bound to obey or implement these regulations, but the sheer economic gravity of the vast EU monolith beside it will just make it easier. Especially given that the British withdrawal deprives moderate eurosceptics or reformers within the EU of their strongest ally. In short, Britain will have been reduced from the second most important nation in the EU to a de facto EU protectorate, a dominion state, nominally independent but behind closed doors still caught in the EU regulatory web. But with no British voice at the table. No commissioner, no ministers, no MEPs representing the British view. Even better, the British people will never know, seeing the blue flags vanishing but not knowing that the EU influence remains. As coups go, it’s a very British one. 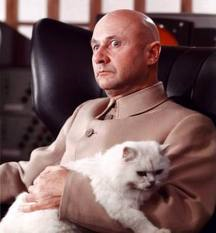 If Blofeld were a European Federalist, he’d be very pleased with Agent Farage. Very pleased indeed.